It was the umpteenth exhibition from Barça’s German goalkeeper this season. 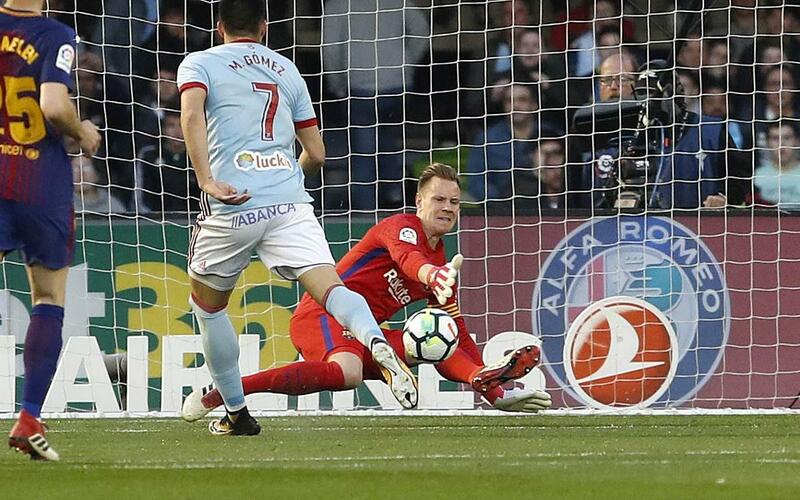 Marc-André ter Stegen, who was captain for the first time against Celta, again demonstrated his abilities between the posts, making two great saves in the game (2-2). In the 11th minute, the former Mönchengladbach No.1 magnificently stopped a shot by Maxi Gómez, but the most spectacular save came just after the half hour. Brais Méndez curled his effort towards the top corner, and with the whole stadium expecting to see the ball nestle in the back of the net, the German flung himself full-length to tip the ball around the post. Ter Stegen had safe hands throughout, and he remains the only player who has played all the minutes of the club's unbeaten streak in the league, which now stands at 40 matches. Below, don't miss either sideline footage from Celta v Barça!